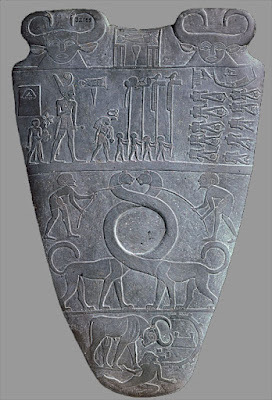 Form: Palette of Narmer from Egypt's Dynasty 1 dated circa 3100 BCE is in low relief and made out of mudstone. It is stylized and subtractive with relatively little or no depth. It is fairly symmetrical with balanced features on both sides and stands approximately 25" in height. The Palette is about 6" thick and convex. It is has been carved in low relief on both sides. The figures are generally in composite view and it is highly stylized. In this view, all the body's features but the torso are shown in profile, the torso exhibited from the frontal point of view. 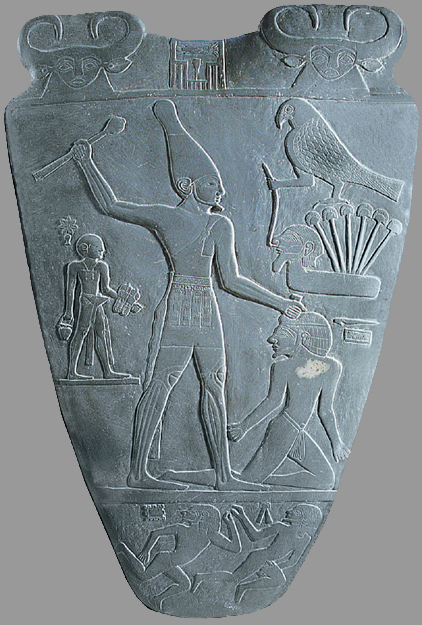 The palette's front features Narmer with the White Crown of Upper Egypt. Behind him is an attendant holding his sandals and to the right is a falcon holding a rope with a human head. The falcon is perched upon papyrus while Narmer is ready to bring his enemy down. 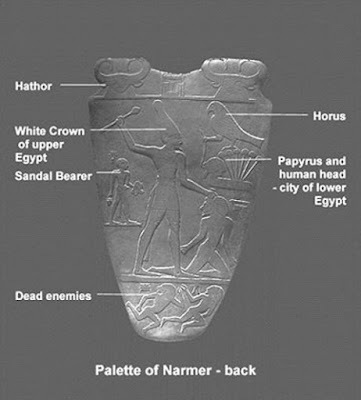 Below Narmer are two dead people. On the back of the palette Narmer is wearing the Red Crown of Lower Egypt behind him is his attendant holding his sandals and in front of him are his minister of state and for men. In front of them are decapitated bodies with a falcon watching them. Below two men hold onto feline creatures who's necks are entwined around the indentation in the palette. Below, a bull out side of the gates of the city is harassing an enemy or is knocking down he walls of a city. The picture plane is divided in registers that define space and stories. Iconography: Marylin Stokstad's "Art History," refers to the composite view as a "memory image" in her section concerning "Representations of the Human Figure," Stokstad's discussion discusses this canon or formula of proportion as being fairly symbolic, therefore, the composite view can be both formal and iconic. When a figure, like the larger figure of the king, is displayed in such a way that all attributes of the physical body are shown at the same time. 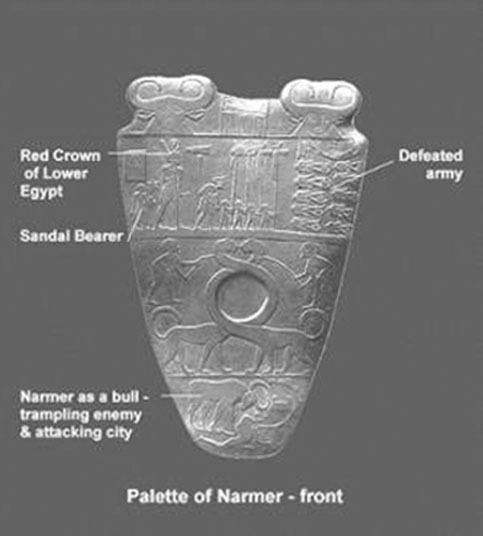 Composite view was often used to establish social/hierarchical status, which explains why Narmer is depicted in such a way. He was an Egyptian aristocrat. Also, the composite view may have been intended to portray perfection and thus enhance the image's supernatural power. Composite view would be then be really useful in tomb art, since the early Egyptians believed that the spirit of the dead could enter a secondary body in the afterlife.